Biographical information about Johann Gutenberg is scarce and hard to interpret, but archival sources contain detailed accounts of some of his business ventures. He was born in Mainz, Germany, around 1400 in a patrician family involved in goldsmithing and associated with the local mint. His family name was Gensfleisch, but contemporary documents refer to him as "Johann Gutenberg" or "Johann Gensfleich, commonly called Gutenberg" because his parents owned a townhouse known as Gutenberg. His full name could be rendered as Johann Gensfleisch zur Laden zum Gutenberg. Nothing is known about his upbringing and education. If he was to follow in the family business he might have learned metalworking skills that would have helped him to devise methods of cutting and casting printing types, but there is no supporting evidence for this supposition. Nonetheless, it is clear that he was mechanically inclined. During a period of civic disturbances, he quit Mainz and went to live in Strassburg where he engaged in commercial speculations based on his inventions. He proposed to make mirrors for sale to pilgrims, who could use them as devotional accessories while viewing the holy relics at Aachen. Some of his investors were disappointed to learn that the pilgrimage to Aachen would take place later than they expected and asked him about other inventions, which he described in strictest secrecy. After one of the investors died, his brothers brought a suit against Gutenberg concerning the finances of the partnership, and in the course of their testimony some witnesses mentioned technical details suggesting experiments in printing. On this basis some scholars claimed that Gutenberg was working on this invention in Strassburg as early as 1438, but the legal documents are not entirely clear on this point, and it is possible that the witnesses were actually discussing the manufacture of mirrors. Legal documents of a later date contain a convincing account of Gutenberg's attempts to establish a printing business. He returned to Mainz sometime between 1444 and 1448 when he borrowed a sum of money for unspecified purposes. 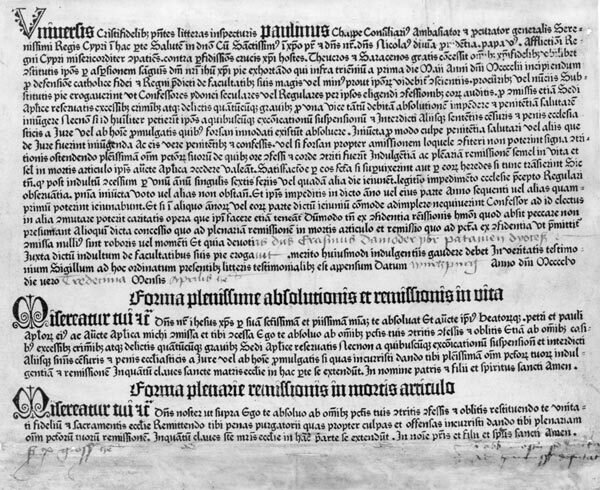 In November 1455 a Mainz notary named Ulrich Helmasperger drew up an account of litigation concerning loans Gutenberg obtained to set up a printing shop, hire workers, and purchase supplies such as paper and parchment. Helmasperger registered the complaints of an advocate and moneylender Johann Fust, who said that he had loaned Gutenberg eight hundred gulden at six percent and invested another eight hundred gulden in a partnership to undertake "the work of the books." Fust demanded repayment of the loans plus accumulated interest, an amount indicating that Gutenberg began to borrow money from him in the middle of 1450. The exact outcome of these proceedings is not known, but it seems that Fust took over the printing business, which Gutenberg had put up as collateral to secure his debts. Paulinus Chappe, commissary. Indulgence, for contributions to the war against the Turks. [Mainz: Printer of the 31-line indulgence (Johann Gutenberg), 1454–1455]. PML 22226. Purchased by J. P. Morgan, Jr., 1924. But that was not the end of Gutenberg's typographical career. While winding down his partnership with Fust, he may have been running a second press in Mainz which issued cheap schoolbooks and job printing such as indulgences and calendars. He was probably involved in the printing of Johann Balbus's Catholicon, an early encyclopedia, first printed in 1460 and reprinted from the same setting of type in around 1469 and again around 1472. The type was cast in two-line units, which could be easily retained for future use. Other books were reprinted in the same fashion. If Gutenberg had a hand in the production of these books, he deserves special mention in the history of printing not just for the original invention but also for his experiments with publishing steady sellers on demand, a logical outcome of the invention. Gutenberg appears to have lived in some comfort during his last years, having received a pension and other perquisites from the archbishop of Mainz in recognition of his faithful service. The archbishop promised to give him food and wine for the maintenance of his household, as well as apparel befitting his position as a member of the archbishop's retinue. Although living in retirement, he had types and other printing equipment in his possession when he died in 1468.